​When I think of encyclopedias I immediately think of Britannica. This version is for elementary school students, and is suitable for the grade levels that I see daily, kindergarten through fifth grade. There are also middle and high school versions. 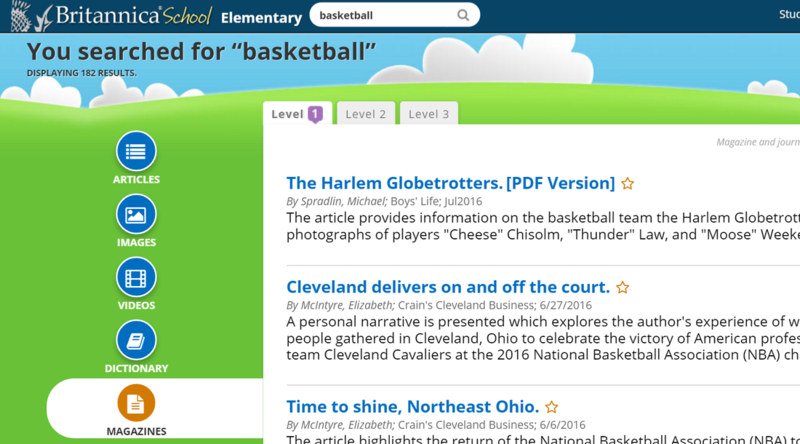 I noticed that you can easily switch to the other levels when using the elementary version if you select a more difficult text on a particular subject or article. ​On the homepage of the database there are scrolling questions to evoke student interest. I’ve not been on the website enough to know if these questions change regularly, but I hope that they do. I believe this tool will encourage students to investigate new topics and find answers to new questions based on the scrolling questions from the homepage. There is also a section at the bottom of the homepage displaying suggested topics to search such as articles, media, biographies, animal kingdom and geography. I know students will find these selections handy when using Britannica to find specific information or even for pure exploration of information. It seems that you always have some students that want to learn more about everything and they would certainly enjoy using this online version of Britannica. ​Students will find the related article section especially useful. I also find the toolbar that is displayed practical. Students can easily make the text larger or smaller, print the article, email the article, favorite it, translate and even cite the source with formatting options. The feature I can see teachers using the most is the option to make text larger. Especially when they are projecting this resource and teaching students how to read through an article to find relevant information. A teacher can make the text large and discuss how students would need to reword the facts in the article to make it their own when writing a report. The teacher could have students act this out or work with a partner to reword parts of articles that are pertinent to their research. The tool that allows you to cite the source with formatting option is also extremely ideal for teaching students the importance of citing sources and giving credit to where information is found. This is a terrific tool for elementary as well as middle and high school students. Making citation easy will make your online encyclopedia service compared to others stand out as being user friendly. Currency of information was a bit lacking when considering biographies. I know my students would like to see current basketball stars like Stephen Curry, LeBron James, and even Kobe Bryant that recently retired. The basketball players that you are able to read about are mainly Michael Jordan and Magic Johnson. Considering this is an online tool and easily updated, I was hoping to see more present-day athletes. This would be a great addition to the current Britannica. It is hard to keep current biographies on the shelves of the media center, because they are ever-changing, and I was looking forward to this being a great solution to that problem. I will keep looking for an online encyclopedia to meet this need. ​The articles have a teacher section listing the standards related to each article. The standards are broken down based on grade level and includes lexile levels. There is an option to view U.S Standards, Common Core Standards, and Canada Standards. This would be convenient when planning lessons. 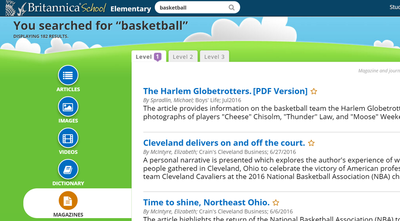 Overall, I am excited to use Britannica School Elementary online version and to tell other educators about this resource. ​Grades: 3 and up. Subject(s): All. Overall rating: 8.